Adding a marketplace to Battle.net is taking longer than Blizzard expected, and there's even a chance the project might get cancelled altogether. 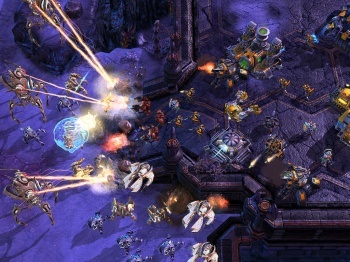 Dustin Browder, StarCraft 2's lead designer, says that Blizzard is "struggling" to create a marketplace for its Battle.net platform. This is the first time that the developer has ever tried to build such a service, and Browder says that there are a lot of difficult issues to solve before it can launch. Blizzard originally announced the marketplace for Battle.net at Blizzcon in 2009. It was intended to be a venue for players to trade maps for StarCraft 2. This would include both free maps, and player-created, "premium" maps. The marketplace was supposed to launch soon after StarCraft 2's release, but, as yet, still hasn't materialized. Browder said that player's right issues - like how to prevent players from ripping off other people's content - were proving a stumbling block, as was working out appropriate price points. He said that there wasn't a firm launch date that Blizzard was working towards for the marketplace - which isn't all that unusual for the developer - but that people shouldn't expect to see it in the near future. In fact, Browder said that there was a chance that the marketplace may never see the light of day. He didn't suggest that Blizzard was really considering cancelling the project just yet, but he also didn't rule it out either. He pointed out that Blizzard had cancelled Warcraft Adventures - a game that was early complete - and implied that the marketplace could suffer the same fate if Blizzard couldn't figure out how to make it work.